You are currently browsing the archives for the Heartland category. By comparison, Robbie Mook, Mrs. Clinton’s campaign manager, couldn’t get it more wrong than when he said “if you ask me what is the single greatest headwind we faced in the race … it was the two letters by James Comey.” I won’t deny that those letters produced some strong headwinds. They didn’t happen by themselves, though. If Mrs. Clinton hadn’t tried hiding her State Department emails from FOIA requests by using her own server, there wouldn’t have been a Comey investigation. The ‘Comey headwinds’, therefore, were Mrs. Clinton’s fault. Mrs. Clinton’s spinmeisters simply re-inforce the images that a) it’s never her fault, b) she lives by different rules than the little people and c) Mrs. Clinton doesn’t accept criticism, especially as a presidential candidate. I could get long-winded but I won’t. What we know about Mrs. Clinton is that she’s dishonest and uninteresting. It’s time for her to leave the national stage — forever. A week later, more than two dozen reporters chased the next presidential cycle’s first unicorn, Hillary Clinton, around an Iowa community college on her first official campaign stop. The optics of that was as comical as a tiny car releasing scores of clowns into a circus ring. But it doesn’t amuse people like Garfein, who wish the media would chase down government corruption and incompetency with the same gusto. The media are, for all intents and purposes, Hillary’s puppets. For all the talk about how Hillary won’t get the same kid glove treatment from the media like then-candidate Obama did, it’s looking like the media isn’t exactly fired up to investigate Hillary. While she won’t get the slobbering coverage that President Obama got, she’ll get kid glove treatment. This week, we saw the Hillary ‘correspondents’ do some embarrassing things. First, they acted like puppets chasing her vehicle around a community college building. 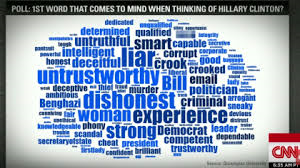 This morning, veteran NPR political reporter Mara Liasson told media critic Howard Kurtz “For some reason that I’ve never understood, the public wants to know everything that the Clintons do.” That’s what Beltway reporters think about the people’s appetite for the Clintons? Seriously? There’s no finer example of the difference between real reporters from America’s heartland and ‘reporters’ from inside the DC Beltway. PLEASANTVILLE, Pa. – The homemade sign along state Route 96 in Bedford County could easily be missed if a driver is distracted by the winding curves at the base of the Allegheny Mountains. “Our country is dying. Please pray for all of us,” it says in blue letters on a white board. A bouquet of slightly wilted wildflowers is tied to it with a blue bow. The sign doesn’t blame anyone in particular; no political brand or elected official is named, no familiar tagline from social media or cable news is part of the message. In fact, its poignant words (all lower-case, no wild-hare punctuation) and slightly hidden position in some ways reflect the underground populist movement that this column has warned about for months, moderate in tone, big in impact. When Eric Cantor lost his primary race Tuesday, it wasn’t because he wasn’t conservative enough for his base. It wasn’t because of the Republicans’ tea party element. It had nothing to do with immigration reform, or some Democrat conspiracy to flood the polls. And it was not driven by right-wing talk-radio hosts or operatives from Heritage Action, Club for Growth, Citizens United or ForAmerica (which claimed Cantor’s defeat was an “apocalyptic moment for the GOP establishment”). This was a complicated recipe, according to Republican strategist Bruce Haynes. “There were more than four-and-twenty blackbirds baked into this pie,” Haynes said, adding that ultimately the loss had everything to do with Cantor: He lost touch with his constituency; he became too Washington, too associated with the D.C.-bubble brand; he forgot how to relate and to be that guy from his district. Something like that is happening in Minnesota, where the DFL is just waking up to the fact that Iron Rangers are upset that they’re being ignored. They’re being ignored because environmental activists are essentially telling the DFL to ignore the Iron Range. There’s no question but that these Rangers want a new influx of mining jobs and upper middle class incomes. There’s no question that professional environmental activists hate mining, especially precious metals mining. The DFL is taking the Iron Range vote for granted. That’s the first step in activating populism. One thing that hurt Eric Cantor the most was that people thought he talked out of both sides of his mouth. He told his constituents that he opposed amnesty, then he supported the Senate’s comprehensive immigration reform bill. Technically, Mark Dayton issn’t talking out of both sides of his mouth. He’s just doing whatever he can to not get either side upset. Al Franken is even more ‘cautious.’ He isn’t saying anything on the subject. Sen. Franken didn’t mention mining during his 26-minute-long acceptance speech. Mining isn’t mentioned on his campaign website, either. If there’s anything that Eric Cantor’s loss tells us, it’s that ignoring major constituency groups is potentially disastrous politically. In a brief defending the law, the Justice Department says the requirement for people to carry insurance or pay the penalty is â€œa valid exerciseâ€ of Congressâ€™s power to impose taxes. Congress can use its taxing power â€œeven for purposes that would exceed its powers under other provisionsâ€ of the Constitution, the department said. For more than a century, it added, the Supreme Court has held that Congress can tax activities that it could not reach by using its power to regulate commerce. Whether the Supreme Court has ruled that “Congress can tax activities that it could not reach by using its power to regulate commerce” is irrelevant to the extent that the Supreme Court isn’t infallible. As human beings whose rulings are often driven by their policy preferences, previous rulings might well be wrong according to the text of the Constitution. I’d argue that the mandates are unconstitutional because providing health care isn’t one of the Constitution’s enumerated powers given to the federal government. If the Constitution prohibits the federal government from providing health care, then it can’t argue, in essence, that they can tax people for not doing what the federal government isn’t authorized to mandate. It’s a tax according to that definition. More importantly to this situation is that the underlying activity, i.e. the mandating the purchase of health insurance, isn’t sanctioned by the Constitution. If the Supreme Court ruled that Congress can force people into buying health insurance, future congresses would be allowed to mandate the purchase of healthy foods or buying hybrid cars or green energy heating systems. Sane justices would see those things as major infringements on a person’s individual liberties. I’m not confident saying that justices like Breyer, Sotomayor or Ginsburg would put a higher priority on individual liberties as they would put on ruling in favor of anything that made their policy preferences a reality. Opponents contend that the â€œminimum coverage provisionâ€ is unconstitutional because it exceeds Congressâ€™s power to regulate commerce. â€œThis is the first time that Congress has ever ordered Americans to use their own money to purchase a particular good or service,â€ said Senator Orrin G. Hatch, Republican of Utah. The good news is that if SCOTUS rules that the mandate is a tax, a future congress and president could eliminate that tax in a simple budget bill. If one congress and administration can levy a tax, then it’s certainly possible for another congress and administration to cut or eliminate that tax. If Republicans turn President Obama into a one-term wonder, which is certainly possible, and if they have control of the House and Senate, which I think they will, their first bill should repeal the health care taxes, if not repealing the entire thing. Democrats challenging Republicans to run on repealing Obamacare will find out that America didn’t like much of it once they learned what was in the bill. They’ll find that the American people rather viscerally hate the legislation, complete with $670,000,000,000 in new taxes. Tarryl’s statement was a reply to a question about fiscal responsibility. What spending $862,000,000,000 on pork projects and keeping government inflated and paying off public unions has to do with fiscal responsibility is beyond me. I’m guessing, but I’m anything but sure on this, that Tarryl is spinning this to mean that voting against the one-time rebate checks is the equivalent to a tax increase. The logic, if that applies in this instance, is this: a vote against spending money on a $600 rebate is a vote for tax increases. In reality, it’s just a vote against increasing spending and a vote against skyrocketing deficits. President Obama touts the $600 checks as a tax cut but it’s nothing of the sort. It isn’t attached to anything in the tax code. In truth, it’s just money spent. I’d further argue that voting to not lower taxes isn’t a tax increase. A tax increase is when you vote to raise the marginal tax rate on small businesses, which is what Tarryl did when she cast the 67th and decisive vote to create a higher income tax bracket for small businesses. That tax legislation would’ve created a top marginal rate of 9.25 percent, significantly higher than the current top marginal tax rate of 7.86 percent. Early in the interview, Tarryl said that “Washington still isn’t working for Minnesota and Congresswoman Bachmann certainly isn’t.” Yes, it’s true that Washington isn’t working for Minnesotans or anyone else. It’s dominated with Democrats who repeatedly refused to listen to the people in passing the stimulus bill without reading it and passing Obamacare against the wishes of the people and without reading the legislation. Tarryl’s solution to Washington being broken? Send more Democrats to Washington to rubberstamp President Obama’s radical agenda that gets anemic support in the heartland but gets stratospheric support on K Street. That’s so intellectually inconsistent that it’s insulting. Later, Tarryl says that Minnesotans want someone who will fight for them, not fight for their own agenda. Let’s stipulate that that’s true. When Michele called for a rally in DC to oppose Obamacare, polls showed that Obamacare had a net approval rating nearing -20, meaning 60 percent of the people opposed Obamacare while 40 percent approved of it. I’d argue, based on those verifiable facts, that Michele was fighting for what Minnesotans wanted. I’d argue that voting against the ARRA was voting the way Minnesotans wanted, too, because ARRA was nothing more than a payoff to big government unions. That certainly isn’t what Minnesotans supported. That’s quite the opposite of Tarryl casting the 67th and tie-breaking vote to raise taxes on small businesses. That certainly isn’t fighting for the things that Minnesotans want. Just because it gets the Matt Entenza/Dane Smith stamp of approval doesn’t mean it gets Minnesota’s stamp of approval. Later in the interview, Tarryl said that Michele voted to raise her own salary, something that didn’t happen. Meanwhile, Tarryl said that she reduced the cost of her staffing. I can’t verify whether that’s true or not but what I can verify is that Tarryl voted in 2007 to raise her per diem from $66/day to $96/day. Factoring in the 43 days of out-of-session per diem she collected in 2008 plus the 280 days of regular session per diem at $96/day, that’s a total of $31,008 in per diem payments. Had Tarryl voted against raising per diem those $30/day, that total would’ve been $21,318, or $9,690 less than less than she collected. Note that that’s just counting the per diem paid in between one session and another. That isn’t counting the out-of-session per diem paid to Tarryl in other years. Note that that money doesn’t factor in the rent subsidies legislators get or the gas money they get reimbursed for. That’s per diem only. Let’s question why Tarryl thinks that a state legislator needs $96/day for incidental costs. There’s just a little catch with that, though. House members get paid a paltry $77/day in per diem. Why does the Senate deserve an additional $19/day for their per diem than the House gets? Tarryl, do St. Paul restaurants charge senators $19/day more than House members? That’s before factoring in Tarryl voting against Amy Koch’s amendment to restore per diem to its pre-2007 rate of $66/day. What’s Tarryl’s justification for not returning to the still substantial $66/day per diem when the state was running a $6,400,000,000 deficit? I’d submit that Tarryl can’t justify that $96/day per diem any time, much less with Minnesota facing a $6,400,000,000 deficit. I’d further submit that Tarryl’s argument that she’s the fiscally responsible candidate in this race is pure spin, that it’s part of Tarryl’s PR campaign, that it isn’t based on reality. I’ve always thought that too many of Tarryl’s statements were fabrications. During a 4:56 interview, Tarryl said at least 3 things that were effortlessly proven as spin or fabrications. If Tarryl can’t be more credible than that, she’ll get pounded this election because voters aren’t in the mood for spin and PR. This election, voters are demanding the straight truth, something that’s apparently in short supply in the Clark campaign office. A new poll out of Ohio, which is called the Buckeye State but is really a political keystone state in this year’s midterm election and beyond — waves a large flag about Democratic hopes to hold the governor’s office. Ohio Democratic Gov. Ted Strickland, like many incumbents across the country, is sliding into deep trouble when racked up against his Republican opponent, former Ohio congressman John Kasich. According to the Ohio Newspaper Poll as published in the Dayton Daily News, Kasich currently leads Strickland 51-45. Last fall, despite earnest campaign efforts by the White House, Democrats lost control of the governors’ offices in Virginia and New Jersey. Another three dozen are up this year. The reason for Gov. Strickland’s problems is the economy. The Democrats took control of a number of governorships in 2006. After the economy went south, a number of these governors haven’t fixed the economy. As a result, they’re getting blamed. But in the last couple of years Ohio’s economy has gone farther south than all of Kentucky. And the latest state unemployment figures show the jobless rate increased from 10.6% in November to 10.9% in December, despite the best economic we-share-your-pain talking and ribbon-cutting by the Obama-Biden administration. “Voters are going to want to hear about the economy first, the economy second and the economy third,â€ said Eric Rademacher, the poll’s director. Strickland’s approval-disapproval is 50-45, but on the economy it’s 54 disapprove and only 42 approving. Having a double-digit negative rating on the most important issue of the day is a quick ticket into retirement. That statistic reminds me of what happened the day before the 2004 presidential election. The last poll before the election showed Walter Mondale leading Ronald Reagan in 10 of the 12 categories polled for. History shows that that poll was essentially useless because Mondale won the electoral votes from Minnesota and the District of Columbia. If you’re wondering which issues Reagan won, here’s the answer to that trivia question: the economy and national defense, the two most important questions of the day. If ever there was a candidate that can exploit this issue, it’s John Kasich. Kasich is the architect of 5 straight balanced federal budgets. During his time as Chairman of the House Budget Committee, the economy created 22,000,000 new jobs. These days, that set of accomplishments probably tell voters everything they need to know for making their pick. It’s still about 10 months until election day. But 47% of Ohioans said their standard of living is worse now than it was 48 months ago. This race says that 2010 is a totally different world than 2006. This year, Democrats are running into a strong headwind. In 2006, they ran with the wind at their backs. It’s understatement to say that this could be a disastrous year for the Democrats. Now what’s left is to see how many seats they lose. VAN SUSTEREN: All right, now, you talk about “all these” special deals, and I take it that you mean, like, all the ones to Florida, to Connecticut. What about to your state alone? Are you willing to give up the…are you willing to say, We don’t want the $100 million in our state, Nebraska? HEINEMAN: Absolutely. Nebraska doesn’t want a special deal. We only want a fair deal. We’re embarrassed by what’s going on. We’re very surprised. Nebraskans are angry and upset about what occurred. And so they need to set this straight. I’ve also asked Senator Nelson…I’m going to repeat it again tonight. He has a chance tomorrow to vote no on cloture. That would be the best thing for Nebraska, the best thing for America. Send this bill back to committee. Go home for Christmas and think about it and get it right. Anyone thinking that Sen. Nelson’s troubles will soon be behind him doesn’t know human nature. According to Frank Luntz, 72 percent of the American people “are mad as hell and they’re not going to take it anymore.” Dr. Luntz said that the anger that people are feeling right now is equal to what they felt in 1994. Back then, huge numbers of voters felt like Congress didn’t represent them, that Congress essentially ignored them. Another similarity between then and now is that people feel like politicians only hear the things said inside the Beltway echochamber. Sounds familiar, doesn’t it? It’s apparent that Sen. Nelson went looking for a deal with Sen. Reid so he could rationalize his support for the bill. It’s apparent that Sen. Nelson was counting on the goodies to buy off the resentment coming from his constituents. Nebraskans figured out that those goodies don’t mean a thing because they’re going to pay higher insurance premiums and their taxes are getting raised. I’m betting, too, that Sen. Nelson wasn’t expecting Gov. Heineman and Sen. Johanns to react as strongly as they did. You can tell that because Sen. Nelson’s speech on the Senate floor was totally defensive. He tried rationalizing his actions. He tried telling Nebraskans that this was a good deal for them. During the course of his radio interviews yesterday, Nebraskans told him that the few trinkets given to the government wouldn’t help them pay higher insurance premiums and higher taxes. Sen. Nelson essentially misread Nebraskans. They’re a fiscally conservative state. They aren’t as gullible as Sen. Nelson needed them to be. He needed them to think that a few trinkets would distract their attention. Nebraskans, led by Gov. Heineman, emphatically responded by telling Sen. Nelson that they didn’t want any part of his bribe. In 2012, they’ll emphatically respond by giving Sen. Nelson an election night surprise retirement party.